While revenue stamps resemble postage stamps, they were not intended for use on mail and therefore did not receive a postal cancellation. However, revenue stamps can display cancellation markings, three types being; by manuscript signature of the person canceling the stamp (usually with date), by hand stamp identifying the canceling agent (also usually with date), or by punch. These revenue stamps can be found in virtually every household on some old documents. These documents include old cheques, wills, passports, gas inspection certificates, sales contracts, mortgages, hunting licences, stock certificates, war tax documents, jewellery receipts, tobacco products, liquor, drugs, playing cards, shipping documents, money orders, legal papers… In fact, the list is almost endless. Digging through old family records and papers could end up being very valuable! The use of revenue stamps goes back further than that of postage stamps. It is interesting to note that the first revenue stamps used in North America were introduced by the British in 1765 under the Stamp Act. The act required all legal documents, permits, commercial contracts, newspapers, wills, pamphlets, and playing cards in the American colonies to carry an excise tax. 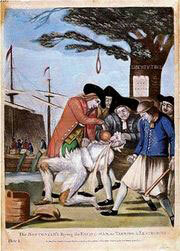 The tax met with great resistance and many preceptors were threatened with tarring and feathering. This unpopular measure added fuel to the growing movement that resulted in the American War of Independence. I have been looking for information on revenue stamps and thanks for the insight. Would it be possible to give out more and on the cat. value of these stamps, especially from the 1920’s (excise) and war tax (1920″s). I have singles and 4blocks, strips. Have not found any books to get an idea on value.